– Gallery M. Schultess, Basel. – Collection W. Hofmann-Hess, Basel. – sale Hôtel Drouot (Poulain), Paris, 1 December 1982, no. 49. – Gallery John Mitchell, London, 1983. – Collection Robert H. Smith, Washington, DC. – Gallery Richard Green, London, 1987. – E. Greindl, Les Peintres Flamands de Nature Morte au XVIIe Siècle, Brussels 1983, pp. 28, 34, fig. 17; p. 336, no. 53. – M.-L. Hairs, Les Peintres Flamands de Fleurs au XVIIe Siècle, Brussels 1955, p. 195; 2nd ed., Brussels 1965, p. 348; 3rd ed., Brussels 1985, vol. II, pp. 4-5. – M.-L. Hairs, The Flemish Flower Painters of the XVIIth Century, Brussels 1985, p. 456. – R. Green, Old Master and Impressionist Paintings, 1987, no. 2. – S. Segal, Flowers and Nature – Netherlandish Flower Painting of Four Centuries, The Hague 1990, p. 183, fig. 30a. – P.H. Decoteau, Clara Peeters (1594-ca. 1640) and the development of still-life painting in Northern Europe, Lingen 1992, pp. 70-71, fig. 82, 197. – K. Alen, Osias Beert. Pioneer of the Antwerp laid table and flower still life, forthcoming. – RKDimages database no. 14588. – Sam Segal documentation (RKD The Hague), no. 10069. – C. Benedict, ‘Un peintre oublié des nature mortes – Osias Beert’, L’amour de l’Art, 19 (1938): pp. 307-314. – E. Greindl, Les peintres Flamands de Nature Morte au XVIIe Sièlce, Brussels, 1956, ed. Sterrebeek, 1983, pp. 22-36, 181-190 and 335-337. – M.-L. Hairs, ‘Osias Beert l’Ancien – Peintre de fleurs’, Revue Belge d’Archéologie et Histoire de l’Art, 20 (1951): pp. 237-251. – M.-L. Hairs, Les peintres Flamands de Fleurs au XVIIe Siècle, Brussels 1955, ed. 1965, ed. 1985; The Flemish Flower Painters in the XVIIth Century, Brussels 1985, pp. 335-346 and 456-457. – S. Segal, A Prosperous Past – The Sumptuous Still Life in the Netherlands, The Hague, 1988, reprint 1989, pp. 66-68. – S. Segal, Flowers and Nature – Netherlandish Flower Painting of Four Centuries, The Hague 1990, pp. 182-183. – S. Segal, Dutch and Flemish Flower pieces until ca. 1800, Brill Publishers, Leiden, forthcoming. The following essay concerns a still life with flowers in a lacquer basket and in a glass vase on a wooden ledge in front of a dark background by Osias Beert. Little is known about the life of Osias Beert. He must have been born in Kortrijk around 1580. Shortly after, in the spring of 1582, the family moved to Antwerp. Beert entered the Antwerp Guild of Saint Luke in 1596 as an apprentice to Andries van Baesrode, an otherwise unknown painter. In 1602, Beert was admitted as a master to the guild. In 1606, he married Margareta Ykens in the Antwerp Church of Our Lady. Between 1605 and 1618, Beert had six apprentices, among whom his nephew Frans Ykens (1601-ca. 1692). The artist died in Antwerp in 1623. Art historians have rediscovered Beert and his oeuvre only in the twentieth century, but in his time, the artist must have held a good reputation. He collaborated with Rubens as a flower specialist. Around 1600, the still life as an independent genre emerged in the Netherlands. Beert was one of the remarkable figures during the development of the early flower still life, together with painters such as Jan Brueghel the Elder (1568-1625), Jacques de Gheyn (1565-1629), Roelandt Savery (1576-1639) and Ambrosius Bosschaert the Elder (1573-1621). He produced a rich variety of still life paintings, varying from sumptuous laid tables with oysters, fruit and wine to brilliant flower bouquets. The painting with flowers in a lacquer basket and in a glass vase illustrates a new type of still life among the flower paintings and one of Beert’s specialisms: the complex flower still life. 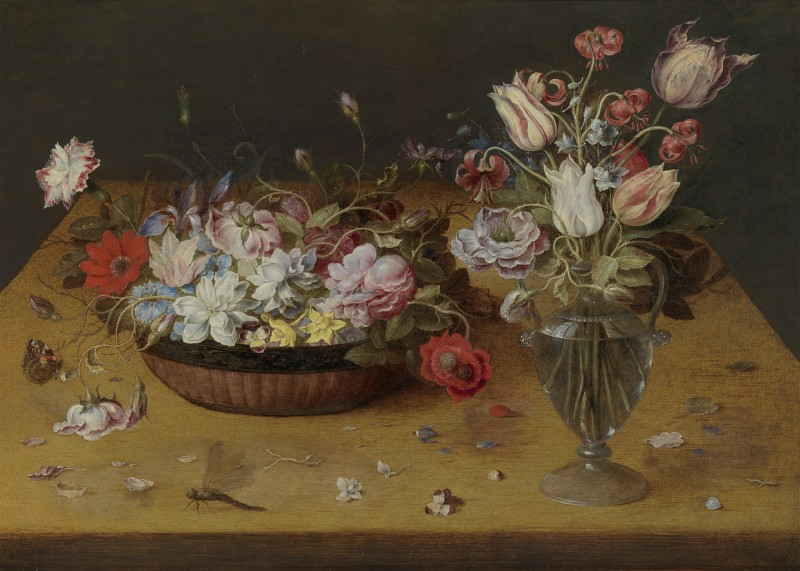 In these works, Beert combined flowers in two, three or even four containers within the same painting, resulting in a complex composition (ill. 1, private collection). The present painting is one of the six complex flower pieces of Beert known so far. The artist always combined flowers in a reed or lacquer basket, a glass vase or a carrier of serpentine or Chinese porcelain. This flower piece contains a remarkable diversity of flowers (cf. the attached list of identifications with 27 sorts of flowers). As nearly always in early flower paintings, the flowers in this work consist of varieties from different seasons. In reality, these flowers could never have bloomed at the same time. Painters sometimes worked for months on different paintings at the same time, or took inspiration from sketches, drawings and prints. Furthermore, the flowers, leaves and twigs strewn on the table denote one of the many aspects of non-simultaneity, for the leaves do not normally come out until after the plant has flowered. Osias Beert rarely signed his work. His compositions are characteristic and his brushwork individual. This particular painting is an autograph work by Beert and shows many of the characteristics of the artist’s flower pieces, for example the flat white increases, the sinuous, impasto delineations of flowers in white or light pink and the many parallel lines in the leaves. The well-preserved yellow colours (e.g. the Narcissus and Pansy) are characteristic of Beert’s work and can be explained by his working method. Beert mixed lead white with other pigments to stabilize yellowish hues. The dragonfly – a common Aeshna – and the butterfly – a Red Admiral or Vanessa Atalanta – are also characteristic. The corners of his butterflies are often rounded, and the dragonflies are frequently s-shaped and fairly plump. In addition, the almost identical objects that are repeated in several works, are also typical. The beautiful glass vase found in this work, returns in a signed Still life with flowers in a glass vase in a niche (ill. 2, private collection). But here the pear-shaped vase lacks the two handles with prunts. The basket with a lacquerwork rim decorated in gold also appears in a still life of Beert in the Louvre (ill. 3). Both containers – the lacquer basket and the glass vase – only appear together in one other complex flower still life in a private collection (ill. 1) and in Pausias and Glycera (ill. 4, Sarasota, The John and Mable Ringling Museum of Art), a collaboration between Osias Beert and Rubens. In the Flowers in a lacquer basket and in a glass vase not only the flowers and composition betray Beert’s hand. The back of the panel is embossed with a chalk layer covered with a brown varnish (ill. 5). In the beginning of the seventeenth century, this treatment can only be found in still life paintings of Osias Beert. Probably this was done to keep the panel steady under different climate changes. The treatment prevents the panel from shrinking or stretching, warping or tearing. This might have only happened to panels intended for export. Beert never dated his work. Only a few of his works offer references to a date, as they were painted on copper that contains a mark with the years 1607 to 1609 on the verso. More accurate dating of works not bearing such a mark – the vast part of Beert’s oeuvre – should always be done with caution. In the Flowers in a lacquer basket and in a glass the complexity of the composition might indicate a later period in his career, between 1610 and 1620. Symbolism is never explicitly present in Beert’s still life paintings. The worm-eaten leaves and the fallen petals and twigs could imply a Vanitas. The butterfly and dragonfly may symbolise the liberated soul, which, after a virtuous life, may rise to heaven in the hereafter. Work of Osias Beert can be found in private and public collections, including the Rijksmuseum and Museum Willet-Holthuyzen in Amsterdam, the Rockoxhuis in Antwerp, the Gemäldegalerie Alte Meister in Berlin, the Musée des Beaux Arts et d’Archéologie in Besançon, the Art Gallery in Brighton, the Koninklijk Museum voor Schone Kunsten in Brussel, the Wallraf-Richartz Museum in Cologne, the Rijksmuseum Twenthe in Enschede, the Musée des Peintures et de Sculpture in Grenoble, the Konstmuseum in Gothenburg, the Kunsthalle in Hamburg, the Museo del Prado in Madrid, the Pinacoteca Ambrosiana and the Pinacoteca di Brera in Milan, the Staatsgalerie in Neuburg, the Musée du Louvre in Paris, the Narodni Galerie in Prague, the Sebastopol Art Museum, The John and Mable Ringling Museum of Art in Sarasota (Florida), the Staatsgalerie in Stuttgart, the Muzeum Narodowe in Warschau, the National Gallery of Art in Washington and the Muzeum Narodowe in Wroclaw (Breslau). Dr. Klara Alen (°1988) studied Art History at the University of Leuven (PhD) and Art Market Studies (MA) at the University of Amsterdam. She works as a research fellow at the University of Leuven. She wrote about seventeenth century Antwerp art historical networks, the Dutch flower artist Margaretha Haverman and the introduction for the exhibition catalogue ‘Power Flower. Bloemstillevens in de Nederlanden’ (Rockoxhuis, 2016). She has been involved in an exhibition and publication about Margaretha van Godewijck (Dordrechts Museum, 2018), a book about engravings of flower pieces and florilegia of the 16th, 17th and 18th centuries (together with Sam Segal) and a catalogue raisonné of the Antwerp flower and laid table painter Osias Beert. In her research, she always combines connoisseurship with archival research and, more recently, the experimental digital method of art historical network analysis. 1 Jonquil Narcissus hybrid Narcissus jonquilla L. x N. pseudonarcissus L.
3 Sweet Briar Rosa rubiginosa L.
4 Pansy Viola tricolor L.
6 Love-in-a-Mist Nigella damascena L.
10 Windflower Anemone hortensis L.
12 Gladdon Iris foetidissima L.
14 Damask Rose Rosa damascene Mill. 15 White Rose Rosa alba L.
16 Poppy Anemone Anemone coronaria L. plena monstr. 18 Tulip Tulipa suaveolens Roth x T. clusiana Vent. 19 Red Martagon Lily Lilium charcedonicum L.
20 Larkspur Delphinium ajacis L.
21 Tulip Tulipa suaveolens Roth x T. gesnerana L.
23 Tulip Tulipa gesnerana L. x T. viridiflora Bail. 24 Tulip Tulipa australis Lk x T. gesnerana L.
25 Tulip Tulipa gesnerana L.
26 Tulip Tulipa australis Lk x T. praecox Ten. 27 Borage Borago officinalis L.
a Red Admiral (butterfly) Vanessa atalanta L.
 Osias Beert, Still life with flowers in four different carriers. Panel, 96 x 120 cm. Private collection. Sam Segal documentation (RKD The Hague), no. 10069. Osias Beert, Still life with flowers in a glass vase in a niche. Copper, 51.3 x 40.6 cm. Private collection. The verso of the painting bears the year ‘1609’. Osias Beert, Still life with flowers in a lacquer basket. Panel, 53 x 75 cm. Louvre, Paris, no. MNR563. Peter Paul Rubens and Osias Beert, Pausias and Glycera. Canvas, 203.2 x 194.3 cm. The John and Mable Ringling Museum of Art, Sarasota (Florida), no. SN 219.